Thoughts from the Well: Say What? In the last two weeks, the older kids have been spending lots of time out at Grammy and Guppy's house. On Boo Bear's birthday, Rooster spent an afternoon over there by himself, and came home with cookies that he had helped make. 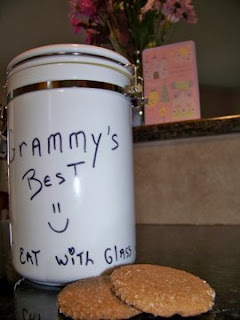 To store the cookies, Grammy sent along a new cookie jar, to be returned for regular refills. I can dig it! What surprised me, however, was my first look at the caption on the jar. Maybe we need to rethink something here? Upon further inspection, I realized the full phrase says, "Must Eat with Glass of Milk" which is a much better thought. I am relieved to know Grammy still has all her marbles. She also bakes a mighty fine molasses cookie. Mmm mmm. That's funny. Hmmm, molasses cookies sound so yummy.